Weslaco, TX (March 27, 2018) – EMMY® award-winning KRGV Channel 5 News, the ABC Affiliate here owned by the Manship Family since 1964, recently launched their new Spanish-language news program on the Somos El Valle 5.2 channel in January 2018. For the new program, which was in development for more than a year, the station has added to their arsenal of Lectrosonics Digital Hybrid Wireless® equipment, which now includes the Duet Digital IEM Wireless Monitor System, LT belt pack, LMb belt pack, HM plug-on and IFBT4 frequency agile compact transmitters, LR compact and Venue receivers. 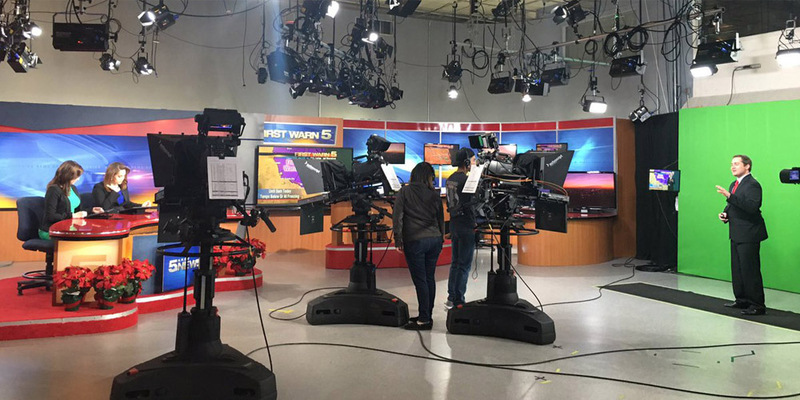 The new Spanish language newscast, is currently being filmed in studio A at KRGV, uses the Lectrosonics IFB system with 6 receiver packs, and the lav mics are on 6 LMb transmitters with a Venue receiver system. “Our news cast has a lot of moving positions and we go live a lot in our studio, so we use Lectrosonics wireless belts to make things easier,” Alfaro says. Before becoming Operations Manager of KRGV, Alfaro started his career as a cameraman working in production and commercials. He then moved onto photojournalism where he eventually became chief, and was first introduced to Lectrosonics equipment. Alfaro’s biggest challenge came at the beginning of his career with KRGV, which is located in Rio Grande Valley, Texas, where there was constant interference from nearby radio stations in Mexico. Once the station went with Lectrosonics, the issue was finally resolved.